Join us at the Bull for our August Storytelling Meetup! This month's theme will be Do-Overs! As always,our themes are open to your interpretation. We need your story submissions by Monday, August 13th! This meetup will be held on Thursday, August 16th from 7:30-8:30 PM at The Bull! Join us at Cypress and Grove Brewery for ourMarch Storytelling Meetup! 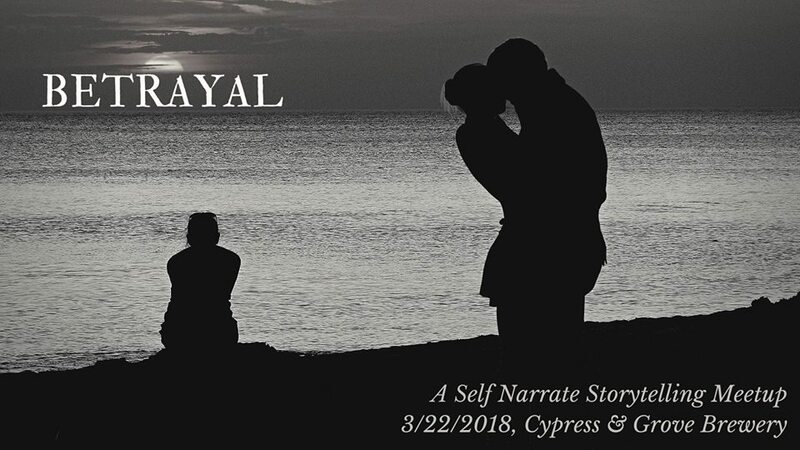 This month's theme will be Betrayal, share a time that you have been betrayed or felt you betrayed someone else whether on a larger or small scale. As always,our themes are open to your interpretation. We need your story submissions by Monday, March 19th! This meetup will be held on Thursday, March 22nd from 7:30-8:30 PM at Cypress & Grove Brewing! Our November meetup is about Sugar! November is National Diabetes Month, so we're co-sponsoring this meetup with the University of Florida Diabetes Institute. As always,our themes are open to your interpretation. We need your story submissions by Monday, November 13th! This meetup will be at The Bull on November 16th, from 7:30-8:30PM. For more information about the UF Diabetes Institute, check out http://diabetes.ufl.edu/ ! Our August meetup is about trouble. Whether it was big or small, we want to hear what kind of trouble you've gotten yourself into - or gotten out of. As always,our themes are open to your interpretation. We need your story submissions by Monday, August 14th! This meetup will be at The Bull on August 17th, from 7:30-8:30PM. This month's meetup is about movement. What role has movement played in your life? This month we'll be sharing stories about movement. As always our themes are open to your interpretation. PLEASE NOTE: July's Meetup is at The Harn Museum of Art, and is part of Museum Nights! We encourage you to arrive early and participate in the different activities happening at The Harn. For more information about Museum Nights, click here. We need your story submissions by Monday, July 10! This meetup will be at The Harn Museum of Art on July 13, from 7:30-8:30PM. This month's meetup is about beliefs. Each of us carries unique beliefs informed by our life experiences. This month we'll be sharing stories about these beliefs. As always our themes are open to your interpretation. We need your story submissions by Monday, May 15! This meetup will be at The Bull on May 18, from 7:30-8:30PM. This month's meetup is about honesty - or dishonesty. Whether your story is about a lie got you into some trouble - or got you out of it, or a time when you had to come out with a difficult truth, as always our themes are open to your interpretation. We need your story submissions by Monday, April 17! This meetup will be at The Bull on April 20, from 7:30-8:30PM. Please note: the meetup will be at Third House Books in March. Reflecting on the past couple of months, we are interested in hearing everyone's story about leaving home. Gainesville is a diverse community. We want to hear the stories of where people come from and how they got here. The theme for March is Leaving Home, and as always, our themes are open to interpretation. This meetup is part of a larger collaborative project between Self Narrate and Charlotte Kesl Photography. The evening will be documented by Charlotte Kesl, an independent photographer whose clients include The New York Times and international NGOs. Every storyteller will have their portrait taken by her. Audio of each story will also be recorded by Self Narrate. We need your story submissions by Monday, February 13! This meetup will be at Third House Books on February 16, from 7:30-8:30PM. For more information about Charlotte Kesl Photography, check out https://www.charlottekesl.com/ ! Let's get together and tell true-life stories! (Meaning, these things actually happened to you!) Our February meetup is co-sponsored by Changeville. The theme this month is: Festival Stories! As always, our themes are open to interpretation. This meetup will be at The Bull on February 16, from 7:30-8:30PM. For more information about Changeville, check out http://www.changeville.us ! This month, share stories about things you’ve made, homemade gifts you’ve received, homecooking, frustrating DIY projects or anything else you can think of. As always our themes are open to interpretation! New to our meetups? Here's how this works. Our storytellers are given 5-7 minutes to tell their story. We need your story submissions by Monday, January 16! This meetup will be at The Bull on Thursday January 19, from 7:30-8:30PM. We’re doing something different this November. We're going to have our storytelling meetup a bit later than usual, from 9PM-10PM. With the later time, the sun's gone done and we thought our theme should reflect that. So we're trying out Self Narrate: After Dark. This could literally be stories that happened at night, or it could be an opportunity to share an edgier story than usual. As always our themes are open to interpretation! We will not be having a December meetup, but we look forward to seeing you in 2017! We need your story submissions by Monday, November 14! This meetup will be at The Bull on November 17, from 9-10PM. Let's get together and tell true-life stories! (Meaning, these things actually happened to you!) Our September meetup is co-sponsored by frank. The theme this month is: Stories That Changed Your Life! We need your story submissions by Monday, September 12! This meetup will be at The Bull on September 15, from 7:30-8:30PM. For more information about frank, check out http://frank.jou.ufl.edu! Let's get together and tell true-life stories! (Meaning, these things actually happened to you!) Our August meetup will have the theme: Come Together! As always, our themes are open to interpretation. We need your story submissions by Monday, August 15! This meetup will be at The Bull on August 18, from 7:30-8:30PM. Let's get together and tell true-life stories! (Meaning, these things actually happened to you!) Our June meetup will have the theme: Everybody Fails. We tend to focus on success, and sometimes, it seems like everyone is moving at a faster pace than we are. Let's take time to share our failures, how we learned from them, how they changed us, and how they've helped us grow. We're often told that failure is not an option, but often, embracing a failure can ultimately lead to even greater success down the road. As always, our themes are open to interpretation. We need your story submissions by Monday, July 18! This meetup will be at The Bull on June 21, from 7:30-8:30PM. Let's get together and tell true-life stories! (Meaning, these things actually happened to you!) Our June meetup will have the theme: Roommate Stories! As always, our themes are open to interpretation, so feel free to share stories about your dog, significant other, grandpa and anyone or anything else you've lived with. We need your story submissions by Monday, June 13! This meetup will be at The Bull on June 16, from 7:30-8:30PM. Let's get together and tell true-life stories! (Meaning, these things actually happened to you!) Our March meetup is co-sponsored by Operation Catnip. The theme this month is: Cat Tales! We need your story submissions by Monday, March14! Let's get together and tell true-life stories! (Meaning, these things actually happened to you!) Our February meetup is co-sponsored by Projects for Haiti. The theme this month is: Multiculturalism! As usual, you are free to interpret this theme however you like. We need your story submissions by Monday, February 15! We'll be updating with the location of the February Meetup soon, so keep checking back! Let's get together and tell true-life stories! (Meaning, these things actually happened to you!) Our January meetup will have the theme: Unexpected Outcomes! We've all had experiences when we're expecting things to go one way, and they end up turning out completely differently (whether for better or worse). We need your story submissions by Monday, January 18! This meetup will be at The Jones B-Side on January 21, from 7:30-8:30PM. For more information about this meetup and to RSVP: Click Here! Let's get together and tell true-life stories! (Meaning, these things actually happened to you!) Our October meetup is co-sponsored by Gainesville Compost. The theme this month is: Renewal! We need your story submissions by Monday, October 12! This meetup will be at The Bull on October 15, from 7:30-8:30PM. For more information about Gainesville Compost, Check out http://gainesvillecompost.com/!